Educated Latymer Upper School, Hammersmith, London. “A” level French and German. University of Surrey B.Sc. in Physics, (10% in Music). Final year theses in audio tape testing and Messiaen. Computer literate: (SADiE digital audio editing, CEDAR, Word, Adobe Photoshop, Acrobat Professional, video editing, etc.). 1967 - 1968 Burmah-Castrol Ltd: Internal Auditing Department. Assistant to Manager. 1972 - 1976 Angus McKenzie Facilities Ltd.. Chief Engineer (Board of Directors 1974-6). Responsible for music recording, legal work, running audio laboratory evaluating tape and audio equipment for manufacturers, magazines and consumer groups. 1977 - 1980 Enigma Records. Recording Manager, responsible for running recording and editing department of independent classical record label. Integrated into Warner Communications in 1979. Label closed by Warner in January 1980. 1980 - 1997 Independent classical engineer. Founder director of Finesplice (independent classical production house), resigned 1987. Trading as Green Room Productions since 1986. 1997 - 1998 Sony Music Entertainment U.K. (Whitfield Street Studios, London). 1998 – onwards: Independent classical engineer. Trading as Green Room Productions. Technical Council Member of Audio Engineering Society (AES) - High Density Audio, Anti-Piracy and Microphones. Former Committee Member of U.K. Audio Engineering Society (AES). 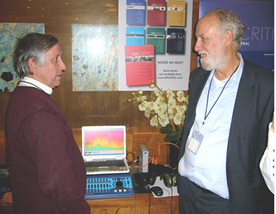 Member of Board of Directors of EUROLABO (audio measurement and standards laboratory in Brussels) 1980-82. External Consultant to Sony Corporation in introduction of digital audio and Compact Disc 1980-85. Training in Digital Audio Editing and Recording Practises for Sony 1980-1. External lecturing in recording techniques at University of Surrey (Tonmeister Course), APRS Training Course, BKSTS. Visiting Professor: McGill University (Canada), Banff Centre for the Arts (Canada). Lecturer: Media Production Services London. Education Workshops in Nagaoka and Tokyo, NHK Japan (1999, 2000, 2001) - surround-sound microphone techniques, etc..
Contributor to audio magazines and technical publications. President of BSRA (British Sound Recording Association). Member MPRC (Music Performance Research Centre). First U.K. classical independent engineer equipped with digital audio equipment (1980). First U.K. classical independent: 44kHz/20-bit (1986), 96kHz (1993), 44kHz/24-bit location recordings (1994), DSD (1998), 176kHz/192kHz High Density (1998). First UK classical independent with in-house DSD multi-channel (2000).